Light green algae is easy to remove. Dark green algae requires a little more work. Black spot lichen (or large black areas of lichen) are more difficult and you must follow instructions. These methods are successful in more than 98% of cases. Make sure you follow these instructions and ask for help if you need it. Please see our guide to using pressure washers by clicking here. What is Algae? It is a simple, usually aquatic, plant that ranges from microscopic to seaweed. It loves mild, damp conditions and will readily grow on stone in the UK due to our mild, damp weather. What is Black Spot Lichen? It is made up of two or three types of organism (algae, fungi and bacteria) living in a symbiotic colony. So, they are fascinating but can ruin the aesthetics of a beautiful external stone very quickly..! For Light Green Algae you can use Algerase. This product has the additional advantage of preventing algae growing for 6 to 12 months (depending upon weather; again, algae loves mild, damp weather). See instructions on the product page. For Dark Green Algae you may require Biorase first followed by Algerase (see below for instructions). For Black Spot Lichen you will require Biorase followed by Algerase. Instructions for Removal of Dark Green Algae and Black Spot Lichen. Pressure washing can be used but is not essential. 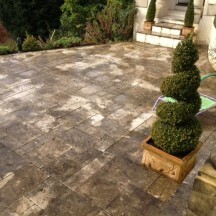 Pressure washing can easily damage stone. If you use a pressure washer please read our guide first by clicking here. Treat a small area first. You can use a pressure washer first but ensure you refer to our guide by clicking here. Apply Biorase neat (undiluted) to one or two representative stones. Give the surface of the stone a thorough wetting with neat Biorase. Leave for 12 to 24 hours. Rinse thoroughy (again, with a pressure washer if this is what you are using; ensure you check our guide here first). You may need to repeat the treatment with Biorase on very severe cases. The reason to do a small area first is for you to ensure you understand the method before you scale up and do the entire area. Once you have removed all, or nearly all, of the Black Spot you should treat with Algerase which will continue to remove the remaining "grey" shadows and will prevent recurrence for 6 - 12 months depending on prevailing weather conditions.